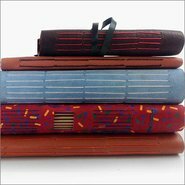 Choose a cover from the range of leather and suede provided, then build your journal using the cartridge paper provided. If you prefer, you can bring your own specialty papers for inside your book, for example pastel, drawing or watercolour papers (A3 size). You can bring a couple A3 sheets of your own artworks, gift wrap, coloured or patterned paper to add character and an individual touch. Bookbinding experience is required for this workshop.